In an epic faceoff between the restrooms of Roger Revelle College, who will emerge as the victor? In this corner is York Hall, whose men’s and women’s bathrooms are on literally opposite sides of the building. And not only that, the amount of stalls in York (a whopping two) is quite pitiful. As for Galbraith Hall, the newly renovated structure has spacious and pristine restrooms available for our use. The quiet study room even has gender-neutral, single-stall restrooms! Needless to say, Galbraith slaughters York any day. Contrary to its rustic appearance, the Old Student Center’s restrooms are surprisingly above par. Both the women’s room near Taco Villa and the gender-neutral stall by Mandeville Coffee Cart have admittedly impressed my cynical heart, though I witnessed quite a mess in the gender-neutral bathroom once. However, the restroom within Mandeville proper is not nearly as stunning. One time, a stall door fell off its hinges as I tried to innocently leave and wash my hands, hitting my foot in the process. Overall, the Old Student Center trumps its dumpy neighbor, Mandeville. This matchup doesn’t spark as much of a competition since I consider them both to be below average. Even so, I think Peterson Hall is the lesser of two evils here. During passing periods between classes, the line in Peterson’s restrooms can be killer, causing me to wait five or more minutes; while five minutes doesn’t sound like a long time, it feels like an eternity when you really have to go. McGill Hall, on the other hand, feels much more run-down. Half of the stalls don’t even have a working lock, and I’m always worried I’ll hit someone with the door as I go in. Let me just say that McGill’s restroom reminds me of a small jail cell, which is not something I adore while doing my business. Both McGill and Peterson deeply disappoint me. When in Geisel, the debate over the best restroom centers around one main factor: volume of people. For example, the restrooms by the Seuss Room and Second Floor East are similar in size, amount of stalls, and cleanliness. The one thing that makes a difference happens to be the crowdedness factor. In my experience, the Seuss Room hosts much less foot traffic than any other area of the second floor, its restroom seldom having any sort of line. If I’m ever feeling too lazy to ascend to a higher floor, I know I can trust the Seuss Room to give me an adequate bathroom experience. 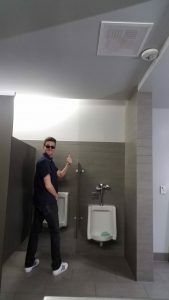 When it comes to these two, there’s almost no contest; we all know that Center Hall has some of the most inconveniently placed restrooms on campus, rivaling even York. During the times I’ve had lectures in Center 101, getting to the bathroom has historically been a nightmare. Why they built the largest lecture hall and the restrooms on completely opposite sides of the building is entirely beyond me. So, if I’m ever feeling fed up with Center Hall, I usually find refuge in Price Center, especially on the second floor. Those bathrooms are some of the cleanest I’ve found on campus, and I’ve never had to wait in line up there. All in all, I’d pick Price Center over Center Hall any day. I have ten beautiful restrooms standing here before me, but only one of them can become UCSD’s next top bathroom. Though the competition was fierce, I have to crown a winner. In the end, I’d have to say that Galbraith Hall came out on top. 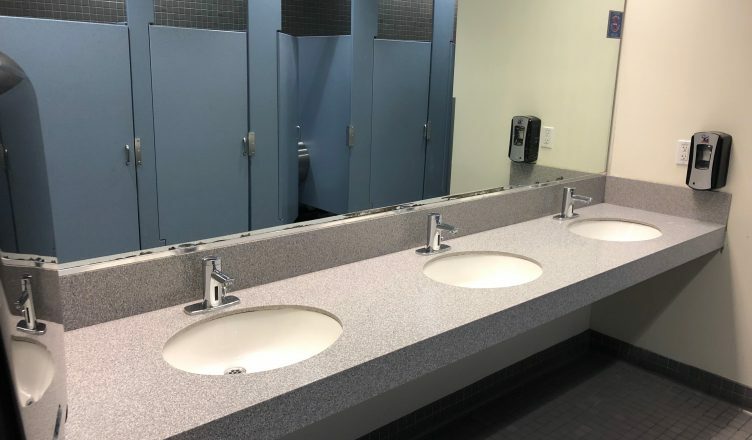 Those restrooms are clean, spacious, and aesthetically pleasing; plus, a gender-neutral option is offered, and the main restroom has the good kind of hand dryers. What’s not to love? Well, that’s all for now! Catch us on the next season of “UCSD’s Next Top Bathroom: The Redemption,” offered exclusively by the Guardian. Toodles!